ONI Bureau: With an aim to generate investments of more than Rs 2 lakh crore, Odisha Chief Minister Naveen Patnaik inaugurated Make In Odisha Conclave-2018, the flagship global investors’ summit at Janata Maidan in Bhubaneswar today. Around 800 delegates from India and abroad are expected to attend the mega event that will continue till November 15. The summit was attended by key dignitaries which included Japanese Ambassador to India Kenji Hiramatsu, among other senior Government officials and delegates from various national and international organizations. 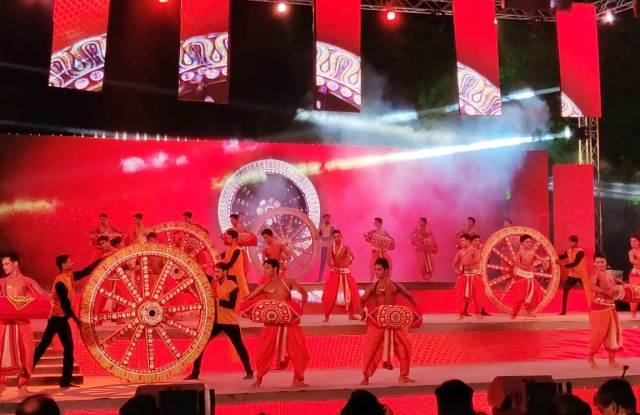 The inauguration ceremony was followed by an evening of spectacular cultural performances involving 200 artists, 50 technicians and which took 30,000 hours of hard work to bring alive the dreams of Odisha through the mission Make in Odisha. The performances were choreographed by nationally acclaimed choreographer Padmashree Aruna Mohanty along with Janardhan Raj Urs and Md. Saiful Haque. Agnimitra Behera and Pravin D Rao composed the music of the expo performances. The exposition included stalls with various interesting aspects from various business domains, which included participation from major organizations like Adani Group, Aditya Birla Fashion & Retail Limited, Britannia Industries Limited, Emami Paper Mills Ltd., Grasim Industries Ltd., Hindustan Coca-Cola Beverages Pvt. Ltd., Indian Oil Corporation Ltd., Indo Nissin Food Private Ltd., ITC Limited, Jindal Stainless Limited, JSW Group, Parle Agro Pvt. Limited, Reliance Jio Infocom Ltd., Tata Consultancy Services, Tata Steel Ltd., Ultratech Cement, Vedanta Limited, among many others. This expo also shared the business perspective from various industry organizations to encourage the future business and collaboration opportunities among various stakeholders. The expo featured around 120 exhibitors from organizations across various industries. The expo was also open to the public and was filled with various interesting aspects for them to explore. The highlight of the expo event was the Odisha Theme pavilion named “Deomali” with mesmerizing projections on the geodesic dome.